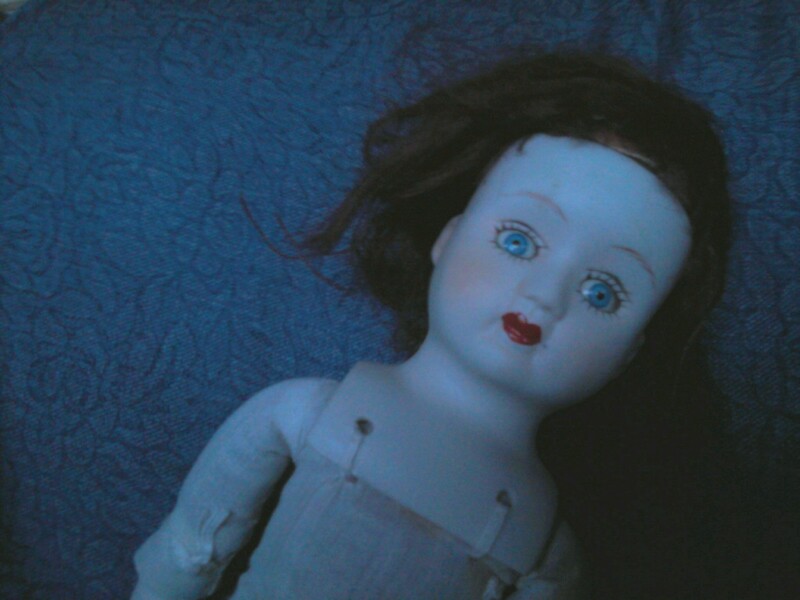 GhoStory Guru: Why Do We Love Creepy Dolls? One of my best friends growing up, Kristina Hals Strobel, has a creepy doll collection to be envied! Here's a treasure she found she was generous enough to share with me. Love it, love it, love it! Dolls don’t scare me the way they do most people. Honestly. 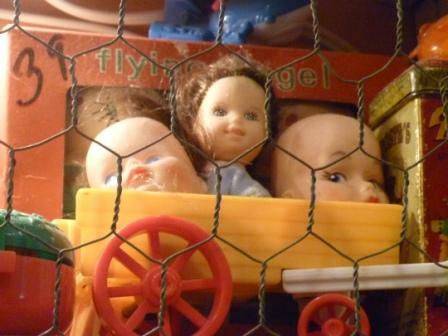 I enjoy the unsettling feeling I get staring at creepy dolls. I’m in a Facebook Group called The Spirit of Halloween. What I love about it is that, although sometimes we promote our work, it’s not a see-me board; rather, it’s a group of people who love talking about what scares them and horror books and films, among other things. Mostly, it’s lots and lots of really amazing scary artwork. One of my favorite weekly events over there is “Creepy Doll of the Week.” Everyone contributes and it’s a ball. But seeing doll after doll, week after week, I began to wonder what it is, exactly, about dolls that scares us. Enter Joyce Carol Oates’ short story “The Doll,” which I just recently discovered. I won’t put spoilers here, but I will say the theme of lost innocence (as a type of death) is prevalent. 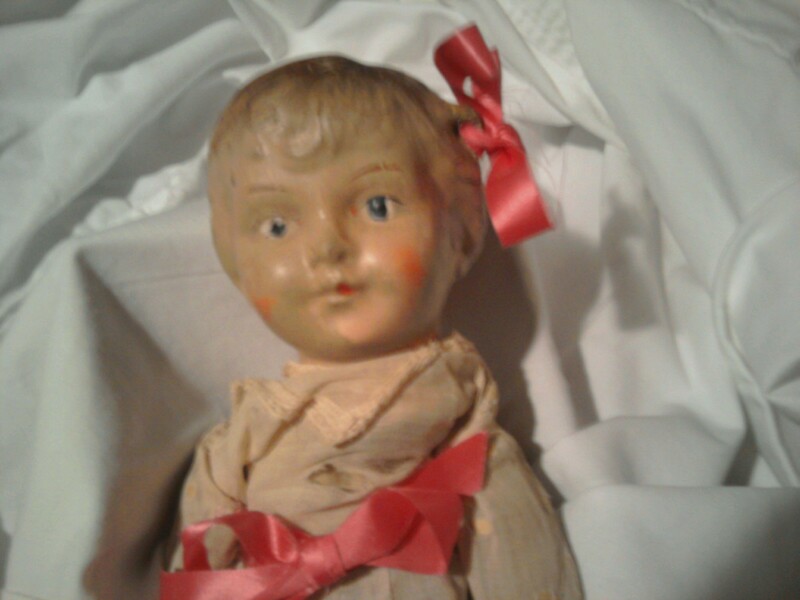 After I’d finished, I put my finger on what it was about dolls that unsettled me. And those eyes foreshadow our own post-mortem. Okay, that was my dark thought for the day. Here are a couple of recent “creepy doll” photos which I either have or will be contributing to “Creepy Doll of the Week”–a couple from my friend Kristina Hals Strobel, who has a collection to be envied and who’s been generous enough to share her photos with me. Enjoy. 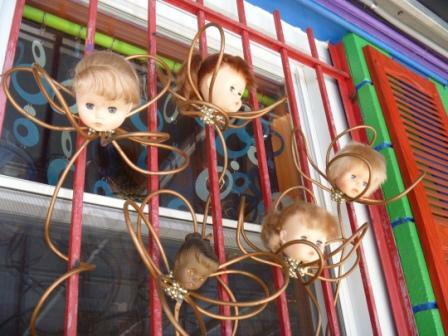 These freaky doll heads are in a display case at the PaperMoon Diner in Baltimore. They were watching me eat my awesome blueberry pancakes and bacon! This is from Kristina Hals Strobel's collection. I find this one particularly disturbing, but it might just be the way she shot the photograph. The doll just looks so...tossed aside. Also from Kristina's collection. I think the look on this doll's face...I don't know, all I can think of is 'massive head trauma.' To me, the eye looks crossed. Leave it to the folks at Baltimore's PaperMoon Diner! So...how would you like a chandelier like this? Am I right? A dolly-ier. I might have to have one custom made and then wired into a light fixture. 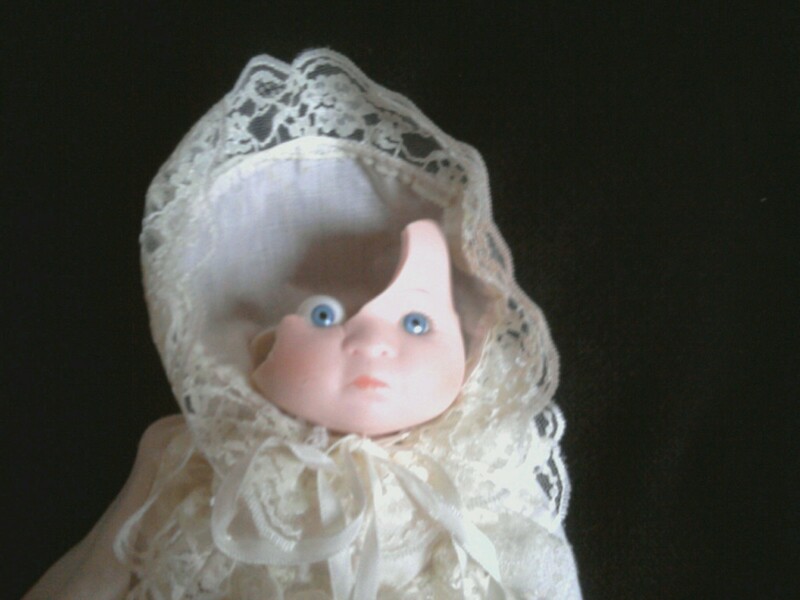 Posted on April 2, 2012, in Deep Thoughts & Fun Stuff, GhoStory Guru and tagged "The Doll" Joyce Carol Oates, Creepy Dolls, PaperMoon Diner Baltimore, vintage dolls. Bookmark the permalink. Leave a comment.